Whether you're getting through a crisis or going on an ordinary camping trip, you're going to need wood for fire. Regular chainsaws are too bulky and require gasoline, and using an axe is exhausting and takes too long. Our pocket chainsaw solves both of these problems. It's small and lightweight, doesn't take a lot of physical exertion, and cuts through trees like butter. it cuts through trees so easily that even seniors suffering from arthritis have used it to cut through trees many times their size. The secret to its effectiveness is in its "triple sided attack. " the blades of the pocket chainsaw wrap around the tree and cuts three sides at once! plus, the bi-directional blades cut deep into the tree every time you push and pull, saving you 50% of your time. CUTS THROUGH TREES LIKE BUTTER - the blades on this pocket chainsaw are made from the exact same razor-sharp steel you'd find on a $400 chainsaw. The blade wraps around any tree and cuts three sides at once, as opposed to regular chainsaws that only cut one side. SAVES CUTTING TIME BY 50% - bi-directional blades cut deep into the wood every time you push ﻿and﻿﻿ pull, reducing your cutting time by 50% so you can spend less time cutting and more time admiring your stockpile. EASY TO CONTROL - the pocket chainsaw has no motor, which makes it easy for anyone to control. It works especially well for the elderly because they don't have to struggle against a powerful motor the entire time, saving their energy to relax with family around the campfire. VIRTUALLY INDESTRUCTIBLE - the pocket chainsaw is made from 65nm rust-resistant hardened steel and is up to 4 times stronger than ordinary steel, making it much stronger than similar chainsaws. Plus, every link of the chain is reinforced with rugged aluminum studs. UNBELIEVABLY COMPACT - condenses into a 4-inch diameter wheel for compact storage while not in use. It even comes with its own pouch so the razor-sharp blades don't damage your other gear. 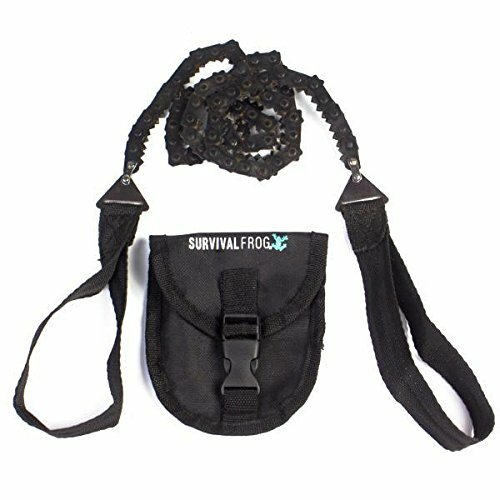 If you have any questions about this product by Survival Frog, contact us by completing and submitting the form below. If you are looking for a specif part number, please include it with your message. Sunfung Survival Pocket Chain Saw Chainsaw 24 Inches Portable Hand Saw For Camping Hiking Backpacking Hunting Boy-scouts Emergency Gear Backyard Cleanup Pruning + Compass Fire Starter!